There is a lot to enjoy about the fall season. Leaves are changing color, school is back in session, the heat and smoke from wildfires have subsided, and brown lawns are greening up again. As some plants prepare to go dormant for the cold season, it is a great time of year for planting. Fall maintenance is important too, so that plants have everything they need to thrive when spring comes. Now is the time for transplanting, pruning, lawn maintenance, and a seasonal clean-up of features across our outdoor spaces. A great place to start with this maintenance is putting down fertilizer on the lawn. Thatching, aerating, and applying moss deterrent are just a few other tasks performed this time of year that pay off with nice benefits to our lawns. Lawn fertilizing products that include moss remover can kill two birds with one stone and help provide more consistent sod throughout. Aerating helps with drainage and improved lawn growth come spring. Thatching helps to cover troublesome bare spots. Both aerating and thatching should be done in early fall or early spring for best results. Fertilizing can happen anytime during the fall or winter, but is best applied in early fall. Follow a regular application regimen for the rest of the winter for great results. Of course, leaf cleanup might be the largest task this time of year. You don’t have to throw the leaves out, though. Using a compost system for those leaves can provide mulching material for shrubs and trees come spring time. Shrubs and trees can also benefit from some TLC this time of year. Fall is the best time to perform pruning on many trees and shrubs, and also a great time to do transplants. Most perennials need to be cut back or pruned heavily to remove spent growth and to prepare plants for optimal growth in the following year. Bulbs and annuals need dead heading and pruning back to thrive in the coming spring. For many evergreen and deciduous trees and shrubs, fall is a good time to shape and remove unwanted growth. Re-applying a mulch layer to landscape beds is another task for the fall and helps insulate more tender root systems from the colder temperatures to come. Finally, don’t forget to winterize the irrigation system and water features before frost hits to avoid damage. It was nice how you said that fall is the best time to shape and remove any unwanted growths on many evergreens and deciduous trees and shrubs. Sadly, I was not able to take that into consideration, and I think I am seeing the effects on them. I hope that it’s not too late to help my plants and overall landscaping this winter. I’ll be sure to request for professional help right away. Thanks for the info! Always happy to help. If you have specific questions feel free to give us a call. I really liked that idea of composting the leaves rather than throwing them out. I’ve been trying to be more eco-friendly, so I think this would be a great way to reduce the use of plastic bags. I also think it could really help my brother’s garden this spring! I appreciate it when you said that applying fertilizer during the fall season is because it is the best time of the year wherein the plants will reap the most benefits from it. Apparently, that is the only thing that I know now about landscaping. That should be a good start though, especially since I intend to have the lawn landscaped sometime this month. Hopefully, that tip is put to good use. I’ll be careful. Thanks. Thank you for mentioning that fertilizer is a great place to start. I don’t really know how any of the things that you mentioned work, though. I would love to try this out or maybe have someone come and take care of it for me and help to teach me along the way. I think that it would be fun to learn. We are always willing to lend a hand. Feel free to give us a call and we can walk through anything confusing about this post. I like how you said that using a fertilizer with moss remover can help to get consistent sod throughout the yard. My wife and I really want to have a beautiful yard and it seems like we need some extensive knowledge in order to achieve that. We’ll have to look into hiring a landscape maintenance service to take care of our yard so that it looks amazing! Thanks for your comment. Let us know if we can help in any way. Sadly we don’t do maintenance. At least not yet! I did not know that one should add moss remover to lawns in order to provide more consistent sod while preventing moss growth on a landscape. If I were to have this applied in my own property, I would find a professional to do it. That way, they can add more years to it. Also, it will help increase the chances of all the plants to bloom well during spring too. I liked what you said about needing to get some pruning done on trees and shrubs at this time of year. I never would have thought that this would be the time to get it done, but it would be great to get our plants all ready for spring. We’ll be sure to talk to some professionals about getting some maintenance done on our yard so we’re ready. I know that once the weather gets a little warmer, I will need to prune my trees and shrubs. I’m sure this time of year is crucial for them. They really need to prepare for optimal growth during the spring, like you said. 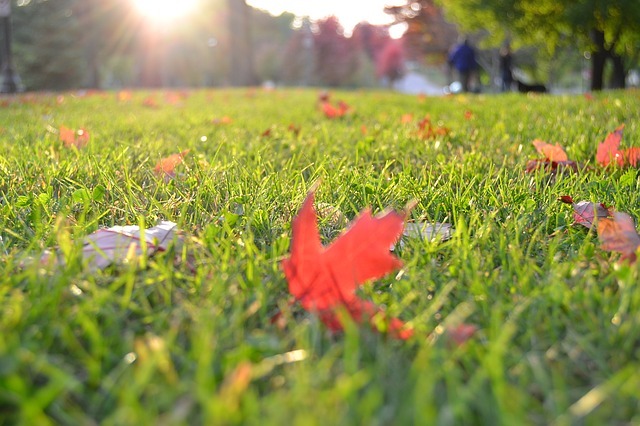 Thanks for helping me understand that maintaining the lawn in fall is the best time since it will ensure that the plants will be ready for optimal growth the next year. I guess I will wait for that time to hire pros to do this for me since we just moved into a house with a lawn which I never had before. However, I might need them for a little while to clean our lawn because of the aftermath when the snow has melted.